Suze Bouwer shows Small Business Owners and Managers HOW TO DO Marketing. Tailor made solutions – Tell me More! WE SHOW SMALL BUSINESS HOW TO DO MARKETING. By signing up you get to benefit from my many years of learning, experience and on the job support. You get my tried and tested Best Practices, the Systems, and Tools that I have developed while starting up my own businesses and helping clients find the easier way to their success.Instead of a DO IT FOR YOU service we take you by the hand to show you how to do your own Small Business Marketing – DIY style. With limitations on just how much a small business owner or manager, AKA Jack-of-all-Trades can do, we have a system that helps you identify what you need to prioritize and focus on so you can market your business effectively. Whether you want to do it yourself or outsource to third parties, it takes knowing the best way to Gain, to avoid pain and GET RESULTS, not to mention BANG FOR YOUR BUCK! By taking you THROUGH STEPS that do the essential basics of defining your business goals and objectives, we help you come up with YOUR VERY OWN, UNIQUE, COMPETITIVE AND SUSTAINABLE Marketing Strategy. Once you are clear on where you want to go, we help you implement a strategy which is uniquely suited to your needs and situation. A strategy that will attract, engage and retain guests, members, clients, diners, patients, customers – whatever it is you call the people or businesses you sell to. 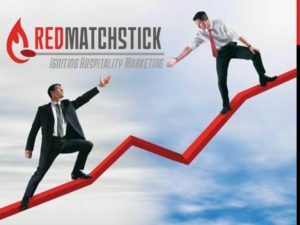 RedMatchstick Marketing Coaching gives Businesses a hand up! The reason we SHOW YOU HOW is because we want to leave you empowered, with lasting benefits and growth as a result of our interaction. 1. A realistic, tailor-made, digital marketing strategy that is customer-focused and achieving your business goals. 2. Realistic expectations about the role of social media and other digital marketing tactics. 3. A clear picture of who your Ideal Customers are and what they want from you. 4. Know where to focus your resources and what to leave alone. 5. Peace of mind from knowing you have defensible competitive advantage. 6. A Plan to save you time and avoid crisis management. 7. Identified and ‘harnessed’ team skills and resources. 8. A clear picture of what works for your business, its customers and audience (and what doesn’t!). 9. A system to measure your performance and return on investment. 10. Saved your marketing budget previously based on traditional marketing tactics. 11. All the Marketing Tools and Templates required to analyze your business for future Strategy updates. 12. A different approach to integrated sales and marketing of your business in this modern era! Check our Testimonials and Mail us to find out more OR CHECK OUT about live training or one-to-one Coaching programs to help you DIY your marketing.